Disclosure has many aspects as we awaken to the hidden truths surrounding us. 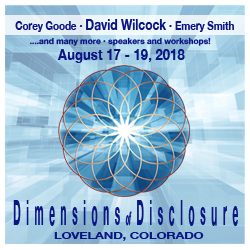 Having passed through the Eclipse of Disclosure, together we have entered a world of no time, leading us into the many Dimensions of Disclosure. It is through our will that we courageously seek the truth about hidden technologies, systems of control, and spiritual evolution. Awareness has created an ever expanding unity in the collective. We are that collective. We are becoming one in the Consciousphere. As our collaborative brilliance folds into this powerful energy of creation, we bravely embrace the unfolding truth of Full Disclosure while celebrating the axiom of discerning wisdom, the abundance in unity and the ever present frequency of love. Our collective force acts as one heart beat that will perservere with determination as we demand and embrace the many facets of Full Disclosure. The community of awakening is widening. 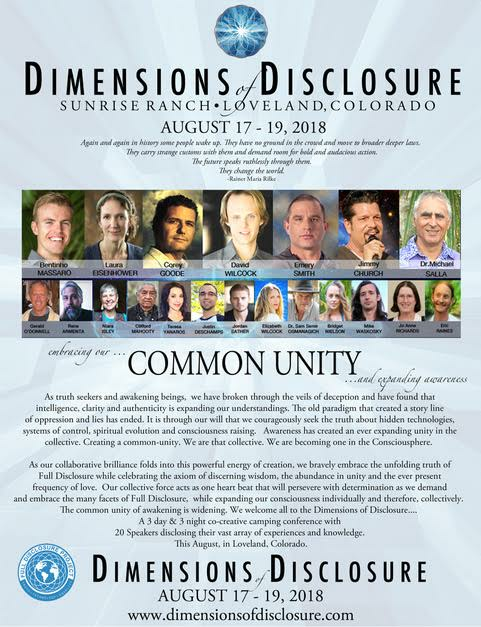 An extraordinary gathering this summer in Colorado!